Inspirational Limerick teen Luke Culhane school textbook feature announced thanks to his viral anti-cyberbullying video, ‘Create No Hate’. Picture: Dermot Culhane. Inspirational Limerick teen Luke Culhane school textbook feature announced thanks to his viral anti-cyberbullying video, ‘Create No Hate’. Luke, who was named Limerick Person of the Year 2016, will be featured in a section of the textbook dedicated to cyberbullying. The textbook aimed at first-year students will be used for Social, Personal and Health Education (SPHE) classes across Ireland. Luke is thrilled that he is getting yet another platform to help kids with his cyberbullying video with the inclusion of his story in the new school book. Luke has just over 10 million views on the video and counting across various social media platforms and news outlets. Luke was honoured to be the Grand Marshal at the St Patrick’s Day Parade 2017 in Limerick City. A budding filmmaker and blogger, Luke was motivated to create the video after being a victim of cyberbullying himself and its success was such that the story was picked up by Sky News, BBC, MTV, Fox, RTE and UTV, among others. 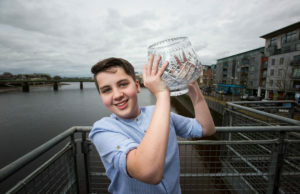 Aided by his father Dermot Culhane and his cousin and godfather, videographer Diarmuid Greene, Luke spent over 40 hours planning, filming and editing the video in time for Safe Internet Day, “I have been cyber bullied myself so that inspired me to make this video to help raise awareness for other people about how to handle cyberbullying. I wanted to show that it doesn’t have to be physical bullying to hurt someone so that’s why I showed the likeness between the two types of bullying. I felt that Safer Internet Day was an appropriate time to release this video to create discussion around the issue”. Richard Lynch also a previous winner of Limerick Person of the Year in 2011 brought Safer Internet Day to Luke’s attention. Other past winners of the title include philanthropist JP McManus, world champion boxer Andy Lee, rugby stars Paul O’Connell and Tony Ward, author Donal Ryan, transatlantic rower Paul Gleeson and Thomond Park developer Pat Whelan. Luke Culhane, whose viral video warning against cyberbullying went viral was named Limerick person of the year 2016. Photo: Sean Curtin True Media. The international admiration for his efforts stretched all the way to December 2016 when he was named Young Person of the Year by prominent French newspaper Mon Quotidien. Luke has also developed a website, www.createnohate.com. Here you can keep up to date with Luke’s involvement in anti-cyberbullying and campaigns that he is involved in. Currently Luke is lending his support to the #loveyourlimerick photo campaign. The campaign, part of Limerick Going for Gold 2017 aims to attract wonderful photographs of communities, places, and towns throughout Limerick city and county. There will be a junior category for those under 21 who enter this category. A cash prize of €500 will be awarded to the winning photographer who submits best overall #loveyourlimerick 2017, with an additional €500 awarded to his/ her community. Runners-up prizes will also be awarded.